(CNN) -- With Hawaii's impossibly perfect temperatures and enviable scenery, it's easy to forget that there's life off the beach. The waves at Oahu's Sandy Beach Park aren't the only attraction. But with Hawaii celebrating its 50th anniversary as a state, it's definitely time to look past Oahu's Waikiki Beach and experience the most populous island's abundance of local flavor. The best place to start is downtown Honolulu, where about 80 percent of the state's population resides. As a result, Honolulu is home to an incredible array of nationalities, creating an environment where there's always something different to taste, try and see. The arts district, between Honolulu's business district and historic Chinatown, "houses art galleries and 20 or 30 bars, three of which were added in the last year," said resident Tim Bostock. "[The district] can be casual, or it can be wild with street parties. We're really turning a corner that there's always going to be something going on downtown." "There's been an explosion -- there are three or four venues with something going on every night," Bostock said. "There are bars with a visual angle like Thirtyninehotel, and the Soho Mixed Media Bar that just opened and proved to be a force; the crowd going into that place is huge." If you're looking for a tamer evening in downtown Honolulu, all is not lost, said Ed Korybski, executive director of the Honolulu Arts and Culture District. There are plenty of midpriced restaurants in the area such as Indigo and Epic, Korybski said, both of which serve Asian fusion cuisine. But for Asian food so authentic you've probably never heard of it, head into Honolulu's Chinatown. "In some ways, it's the Ellis Island of Hawaii," Korybski said. "We have a lot of Vietnamese, Filipinos and Samoans. When you're here, you smell smells you've never smelled before and see food you've never seen before; things that you wouldn't see on the mainland." During the day, Chinatown is filled with food stalls, some of which can cause the average visitor to be a little wary. "Be prepared to try stuff," Bostock recommends. "The booth food will be completely strange to you, but try 'em, they're good." If you're in the mood for authentic Asian but don't want to eat on the run, Korybski recommends Café Joy in Chinatown, a "really local place that has character and serves traditional Thai and Laotian food," Korybski said. "In the back it has seating in the traditional Chinese courtyard, but you would never know driving past it." If you head over to Kapahulu, a neighborhood just inland of Waikiki, you can discover a wealth of local culinary treasures, said Oahu tourism spokesperson Rebecca Pang. Ono Hawaiian Foods is one small restaurant that always seems to have a line out the door. As any Hawaii resident will tell you, if you want to truly eat like a local, you'd better add a plate lunch to the day's menu. It's an only-in-Hawaii concoction that usually features a side of macaroni salad, some form of protein, plenty of rice and a healthy dose of gravy. Pull up a chair at the Rainbow Drive-in or Kanak Attack in Kapahulu to get a forkful. The last must-do before leaving Oahu, Bostock said, is a trip to the North Shore. "Haleiwa is a wonderful surf town with good boutiques and good restaurants," he said. "It's going to change one of these days; it's been the same way for 30 years, so you should see it before it changes." While you're up there, make sure to snag Hawaii's popular warm weather treat of shave ice, slivers of ice with a consistency similar to a snow cone covered with sweet, colorful syrups. It can be found at Matsumoto's, a decades-old Haleiwa staple that can rake out 1,000 shave ices on a sunny day. You can take your pick of tropical flavors, including lychee, guava and passion fruit. Or try this local combination: rainbow-flavored shave ice -- that's strawberry, pineapple, and lemon -- along with a scoop of ice cream and red Azuki beans, which are grown throughout East Asia. For more great food with a side of history, make the trek over to Waipahu. This small neighborhood west of Honolulu still carries the remnants of plantation life, but offers a bit of modern relaxation in the form of one of the most challenging golf courses on the island, Coral Creek Golf Course. After you've cruised the fairways, head to Tanioka's Seafood and Catering, which earned the honor of "best poke," a raw seafood dish that's usually made with fresh fish, seaweed and kukui nut relish, in 2008 from the Honolulu Advertiser newspaper. But on your next trip, don't just stop at Oahu on your hunt for unique Hawaii finds. 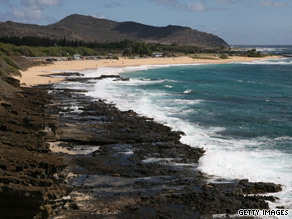 Check out http://www.gohawaii.com/ to get ideas on finding local haunts and hot spots.